Serviceberries! There was a huge, sprawling patch of them, filling of the weedy ditch of a potholed street in a shady part of town. There were more than I could possibly eat. I grabbed a handful off the first patch of trees, but then as I kept walking there were more and more and more. I wonder if you can make serviceberry jam. I've never made jam before. But now I guess I know where to find enough serviceberries for it. 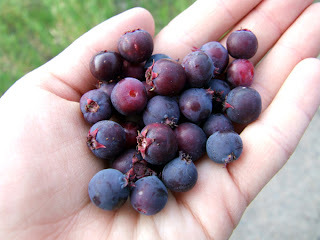 I suppose I should have been more careful and not eaten berries growing right off of the street like that, since plants absorb car exhaust and other pollutants, but it's not a very busy street, and anyway with serviceberries it is kind of hard to resist. As with many wild (uncultivated) fruits, the seeds are large and noticeable, but the flesh is sweet and lightly puckery, somewhat reminiscent of cherries, to which they are related. A bit later on my walk, I unexpectedly wound up on the Superior Hiking Trail, and I found a huge patch of thimbleberries, too. Thimbleberry plants, anyway, only one ripe berry. There's no picture of that because I popped it in my mouth as soon as I saw it. I have for years been meaning to expand my knowledge of wild foods, and I really should get on that. It's so nice to run across these happy surprises, like free snacks on the trail, especially on sad days when you really need it. Oh! The real challenge is to tell which species they were. I recently planted one in my mother's yard as part of a plan to get more small trees in there (atm there is just canopy). I went with the species that the very enthusiastic person at the native plants nursery thought the birds would like best. I've never actually seen what the berries look like before, beyond maybe black and white drawings in tree books. I keep meaning to post about that on LJ. Aww, livejournal syndication! Thank you. That is a fine idea for a blog/website/something. For years I have kind of toyed with the idea of Some Day writing a field guide, but I haven't really done much with the idea because I feel like I'm way underqualified--hell, I barely passed college biology. But you don't have to be qualified to post to the internet! Maybe some day when I have the time and head space and access to all the books I need (okay, I'll probably never have access to *all* the books I need, but, ya know, more books than I have right now). Jiggery-pokery's Soup of the Day | Chicken and stars with a side of mesalamine. My name is Sonya, and I'm a writer, artist, gardener and crazy cat lady living in Duluth, MN. all content copyright Sonya Welter. Picture Window theme. Theme images by billnoll. Powered by Blogger.